I don't generally buy fizzy drinks due to the extra sugar in them, although every now and again they can be quite refreshing. Heartsease farm have there range of all natural soft drinks. Heartsease farm is made from the best ingredients expertly blended with their own spring water on their farm in Wales. Radnor Hills Ltd was founded by William Watkins in 1996 to produce soft drinks at his family farm in Mid Wales. The Watkins family have farmed at Heartsease since 1903. William Watkins commented on his new, premium pressé drinks range saying “Our exciting, new, Heartsease Farm range of drinks reflect the heritage of the farm and our passion for great flavours. We use only the best available ingredients from the countryside, blended with our own spring water, to traditional British recipes. 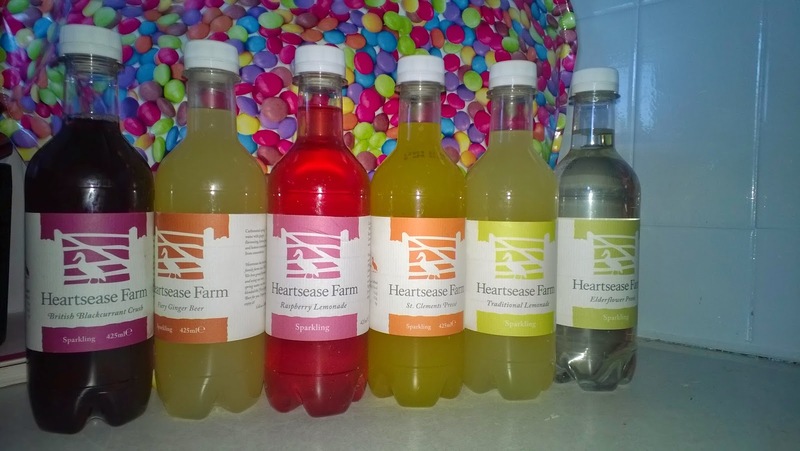 Heartsease Farm drinks are made with natural ingredients sourced from around the countryside, creating delightful flavours. The Elderflower Pressé is a timeless taste of an English Summer, the Raspberry Lemonade is made of natural raspberry juices that have never been concentrated to give it a fuller, fruitier flavour. The British Blackcurrant Crush has the intense aroma of standing in a field of blackcurrants at harvest time yet its aftertaste is fresh and sharply cleansing. St. Clement’s Pressé is a delicious mix of oranges & lemons and brings memories of childhood picnics; the Traditional Lemonade, which was awarded a Great Taste Award, has a revitalising, naturally zesty flavour of Sicilian lemons. All the drinks had a hint of sparkling flavour, all the flavours burst out and flavours all went well together. My favorite was the Raspberry Lemonade. Perfect for everyone that maybe doing a 'Dry January’ or if you’re not, you can try using them as a mixer for a sneaky cocktail.